STEP 1 Preheat oven to 180°C/160°C fan-forced. Line a 12 hole x 1/2 cup capacity muffin pan with paper patty cases. STEP 2 Using electric beaters, beat butter, sugar and vanilla in a large bowl until light and fluffy. Beat in the eggs, one at a time, beating well after each addition. Add mashed banana and beat until well combined. STEP 3 Sift flour and bi-carbonate of soda over the banana mixture. Add milk. Using a large metal spoon, gently stir until combined. Spoon evenly into prepared pans. Bake for 18-20 minutes until golden and cooked through when tested with a skewer. Cool in pans for 5 minutes, then turn out onto a rack to cool. STEP 4 To make the topping, combine cream cheese and icing sugar in a bowl and beat until well combined. Top each cake with a dollop of cream cheese mixture. 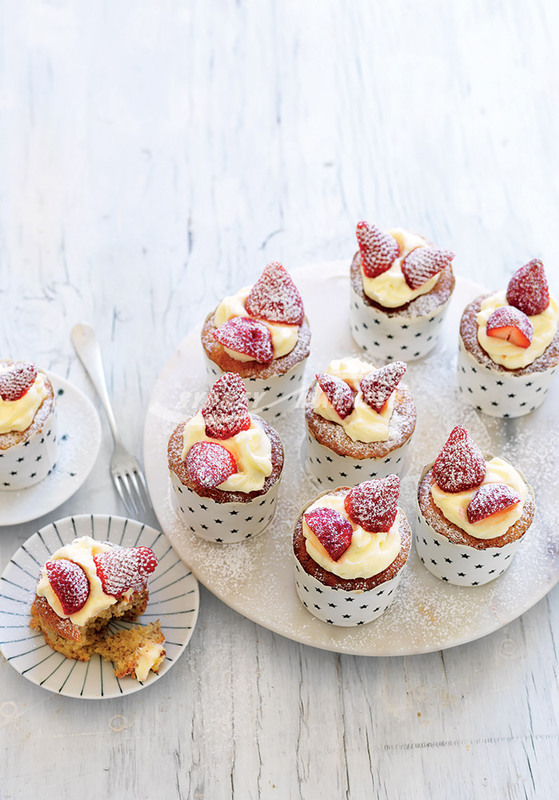 Decorate with strawberries and serve.